This is a silent film for the uninitiated. With kinetic camera work and naturalistic acting, Paul Leni’s The Man Who Laughs builds no barriers to the modern eye. And it’s timely, too. This week, the Academy of Motion Picture Arts and Sciences nominated Heath Ledger for Best Supporting Actor for his portrayal of the Joker in The Dark Knight. Ledger drew his performance from over sixty years' worth of maniacal material, but those first artists and writers needed inspiration of their own, and here's where they found it. The Man Who Laughs begins with an exchange between English king James II and Lord Clancharlie, a nobleman lethally out of favour. Before passing sentence, James declares that he has turned over the lord’s son, Gwynplaine, to the Cormanchicos, a tribe of gypsies infamous for carving permanent grins into the faces of children they capture. Lord Clancharlie meets the iron maiden soon after. The film moves immediately to the child Gwynplaine, his mouth concealed by a scarf, standing on a snow-swept wharf before a boatload of Cormanchicos. They have been banished from England and wish no proof of their crimes to follow them. Left to die in the blizzard, Gwynplaine instead reaches the shack of a charlatan, named Ursus. Ursus takes in both Gwynplaine and Dea, an infant girl, blind from birth. The pair grow up together, become performers in Ursus’ travelling circus show, and fall in love. Disfigured man, blind girl—she loves him for who he really is, doesn’t she? It seems so simple. Yet Gwynplaine (Conrad Veidt), an utterly pure and decent man, refuses to let Dea (Mary Philbin) touch his face. He detaches her from his disfigurement, denying her a complete picture. Leni does the same thing to us. His camera spies on events through windows and half-closed doors; between carriage-wheel spokes; from above and below his actors. In one memorable scene, he places the camera in a ferris-wheel pod, swooping us suddenly upward and backward, then lunging us toward the ground, through several rotations. All of these shots affirm the obvious—that we are removed from the action—but in making it so obvious, Leni prevents us from forgetting it. We remain conscious of our watching, and soon, our point of view seems unhealthy, intrusive, even underhanded. We see more than Dea, but are we seeing it wrong? Gwynplaine is certainly worthy of a stare. Veidt's head is long and pale; his eyes are round, dark and furtive. He combs his hair straight back, so it seems to pull his face after it. His grin--perpetual, painful--completes a character for whom peace is alien. To these features Veidt usually adds a sad look; late in the film, he shows fury. Yet the melancholy and the rage are always set against a grin that cannot alter. His face is in conflict—a battleground between the emotions he seeks to express and one, unresponsive feature that mocks them all. You can't take your eyes off it. As for us, we barely rank above the freak show patrons that populate the film. Our first look at Gwynplaine prompts laughter. Even when he earns our sympathy, Gwynplaine's smile never looks sad—it simply is sad. That's the best we can do, and he knows it. Many times he covers his mouth with a handkerchief, even when no one can see him but us. The film’s other characters range from atypical to weird. Dea is pretty, but cannot see; Ursus has hair like an SOS brush, and spends his days surrounded by carnies and clowns. In the royal palace, a plump and constipated Queen Anne reigns over absurd courtiers, some so overcostumed they resemble birds or pieces of food. Leni found some of the ugliest actors around to play these parts. However, his real jackpot was Brandon Hurst, who plays the wicked jester (later, powerful courtesan), Barkilphedro. It's Barkilphedro, not Gwynplaine, who truly prefigures the Joker--not just in looks, but in temperament and occupation. Take a look at this clip, starting at 2:28. Among this crew, there’s only one character free of disfigurement, disability or regular misfortune: the Duchess Josiana. Played by Olga Baclanova (a duplicate of Madonna, right down to the mole), Josiana enjoys beauty, wealth and an abundance of time. For the rest of the court, she's a titillating distraction—something she encourages, since it prevents her from sharing their boredom. Josiana steals away to the circus, witnesses Gwynplaine’s performance and attempts to seduce him. What would people say? By bringing him into her life, and then to the court, she achieves her only aim, which is to piss people off. The disfigurement will do nicely. Gwynplaine’s agonizing smile first blinds us to his deeper value—he’s either grotesque or comical, and in either case, a curious object. As the film unfolds, we come to understand him and appreciate his character. But we cannot do this unless we embrace the strangeness and consider how it enriches the role, rather than distancing it. Perhaps there's a deeper lesson here. Can modern viewers take this same approach to silent films themselves? Grimacing Gwynplaine looms over the maiden. Though Veidt’s character is totally benign, the public is encouraged to see a monster. Even advertisers presume the worst. 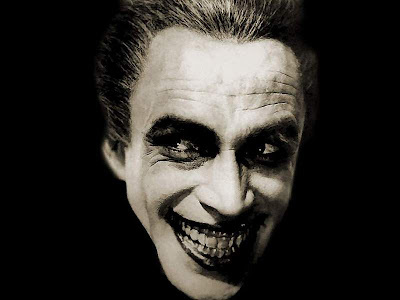 The Man Who Laughs is a terrific introduction to silent film. Made as the era was ending, it takes advantage of techniques and technology unavailable to earlier directors. You’ll see an abundance of outdoor scenes and a minimum of heavy makeup. The characters have lightness and nuance and roundness, freed the heavy moralism of some early silents. In keeping with this, the intertitles rarely ‘set a scene’ before it is played; allowing the characters to express themselves, rather than acting out a prescription. The Man Who Laughs even has 'sound,' of a sort. By 1928, studios could produce sound-synchronized film, though not many theatres could play it. For those that could, The Man Who Laughs provided an orchestral score, some lyrical music (sung off-screen) and the occasional laugh or yell. The film is widely available through Kino International, a distributor specializing in classics. 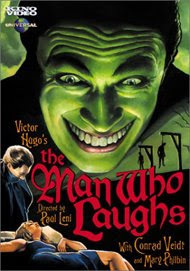 In addition to the film, Kino's DVD includes an excerpt from Victor Hugo's The Man Who Laughs, upon which the movie is based; a short production documentary; photo galleries; restoration notes; and a side-by-side comparison with the Italian version, shot at the same time. Check it out here. I saw this film last wednesday and i Loved! My favourite character is Duchess Josiana,i think that if one day i have a daughter i will name her Josiana :P.
Seriously though, if you can't find any good copies of silent films in Brazil, there's always YouTube. Most of these films are public domain, and in many cases, even very long ones are available there (sometimes cut up into 10-minute chunks). It's not an ideal way to watch movies, but it's better than nothing. Loved this film more than any I ever saw (not that I've seen that much though), the second in list after the Faust of 1926. Thanks for all your comments. I'm glad you enjoy these films just like I do. Juxtaposings: a lonely boy left behind by a ghost ship in darkness,cold and snow , a happy end on another ship in the sunshine.